Aino Venna is a Helsinki-based musician mixing Finnish originality with folk, chanson and jazz traditions. Her debut album, released in October 2012, brought Venna to the forefront of new Finnish singer/songwriters, alongside Finnish contemporaries like Yona and Mirel Wagner, with the lead single “Suzette” achieving significant success on Radio Suomi and received Radio Helsinki’s Summer Hit award. Venna’s lyrics derive from a past time, heavily influenced by literature and film: indeed, she's an arts graduate who also directs music videos. “One of my first memories as a child was that my parents took away my Juice Leskinen C-cassette and gave Elvis Presley instead. First I was very annoyed but soon started to understand that Elvis was the greatest thing ever! I watched loads of these very cheaply done Elvis-movies. My favorite one was called "Kissing cousins". Elvis was playing a double role (! ), the other "bad" Elvis was blonde. Through the hole movie they played guitar and sang like crazies. It made a huge impression on me..
My other childhood hero is Edith Piaf. When I heard her sing the first time I understood that something very important was happening. I didn't understand the words but it sounded like it was the last moment of her life and she was sharing it with us through her song. Piaf and Marlene Dietrich are my idols because they had the courage to change the female role of their times. 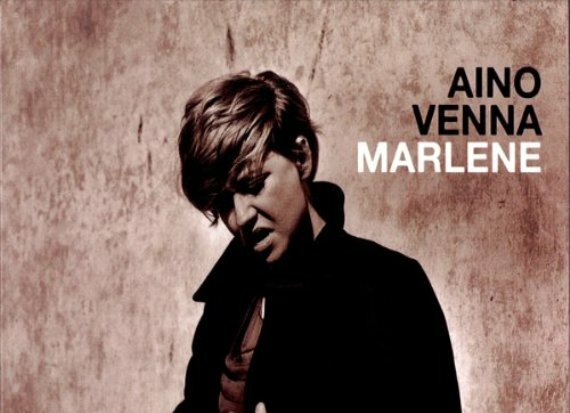 I named our first album after Marlene because of respect of this great artist, woman and a great speaker of peace. Aino Venna has turned from a singer-songwriter solo project into full band with double bass (Erik Michelsen), lead guitar (Joonatan Kotila), ukulele (Kaisu Koponen) and a cajonita (Ville Pystynen). The band performs with a lively touch and though they take influences from the past world they are very much alive with today.